I had a hard time deciding what to do with my first day of break. There are tons of little projects around the house and I can get started on summer construction jobs. I decided to haul a pile of building scraps that were created when I built the fireplace last fall. I loaded up the pickup and went off to the transfer station. 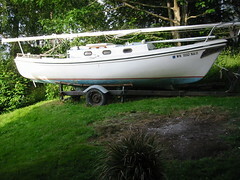 When I got back, I washed the truck and uncovered Ellen Maria so I can start to prepare her for summer sailing. Tonight, Calvin and I played tennis. A real tragedy occurred in our community yesterday afternoon. A local businessman who owns a mom and pop grocery store between Port Orchard and Southworth was murdered with a rifle at close range in front of his store in broad daylight. There were many witnesses and the suspect was arrested within several minutes of the shooting. They have not found a motive as of yet. The victim was a well repected community leader with two teenagers, one who is an acquaintance of Markus. There has been an amazing amount of community supporrt for the family.